One bright afternoon, I had a temptation to explore some more cuisine of Mexican variety, especially after making my visit to El Caballito and being exposed to some Mexican for the first time in Toronto (see my post on El Caballito here: http://foodieutopia.blogspot.ca/2016/07/el-caballito.html). Ravi, another Mexican cuisine lover (though he only had Taco Bell and Chipotle! 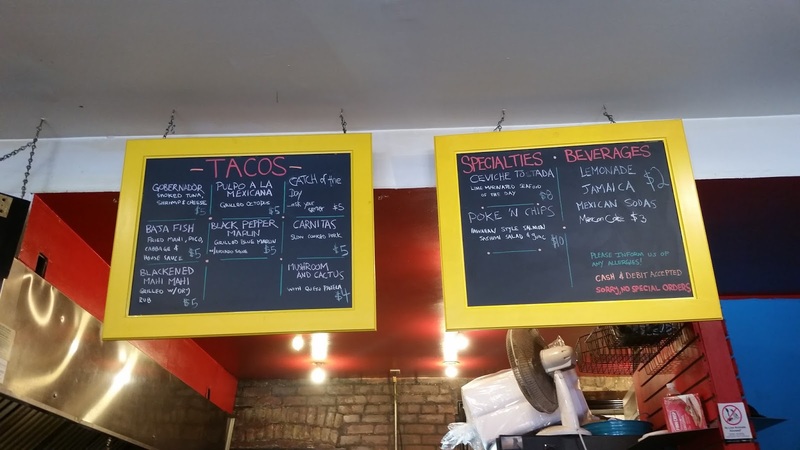 ), joined me on this excursion to test try Seven Lives in Kensington Market – a famous taco joint that has gained a fair amount of popularity among Torontonians. Seven Lives was definitely popular – we got there in the afternoon (around 1pm) and the place had a line-up leading out of the entrance. It could have been a result of the place being quite small or the tacos were just that great (or both!) We were about to find out! It took us a little bit of time to get to the cashier, and when we ordered we had to wait again for the people ahead of us to get their tacos before we finally got ours. In addition, Ravi ordered a drink with our order and they would have forgotten to give him his drink if he didn’t remind them, which was a bit of a turn-off when it’s expected that service would remember what we ordered. To add to some of the displeasure, there was absolutely no space inside to eat- Seven Lives literally had one table in the restaurant, and the ledge tables had no seats for customers to sit. That’s why we found ourselves wandering Kensington Market in search of seats. Luckily I recalled a seating area I stumbled upon in Kensington from my visit to Dirty Bird with one of my girl friends, and we got to try our Seven Lives tacos out on a patio area in the heart of Kensington. 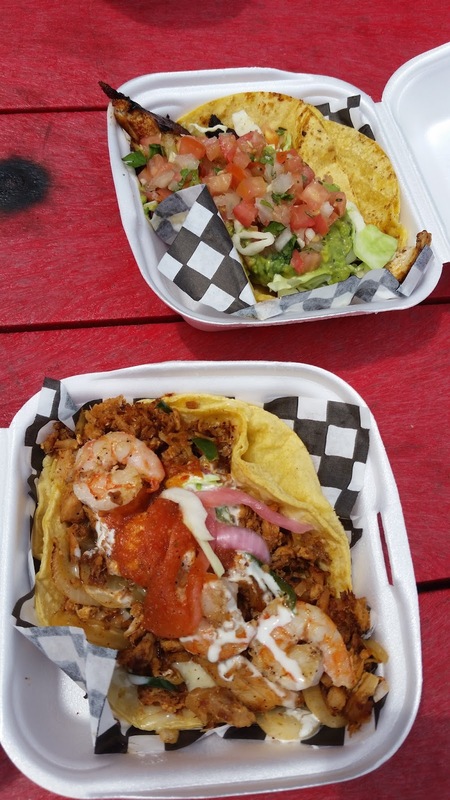 Once we had settled and we opened our cartons with our tacos, it definitely looked pleasant. Seven Lives gets credit for presentation, however the taste was a bit overhyped. My selection of Gobernador, which apparently is Seven Lives’ signature taco, wasn’t as “signature” as I thought it would be. The smoked tuna was way too dry and the sauces did not seem to clash nicely. In addition, I didn’t realize the sauces were a bit spicy, so for me being a non-spicy lover, couldn’t truly appreciate the taco. Ravi’s selection of the Blackened Mahi Mahi seemed to also be a disappointment, he said that the white sauce in his taco was a bit overwhelming, and did not clash with his mahi mahi. In addition the taco bread itself seemed to be dry just like mine. And so, the curiosity of Seven Lives and their “famous” tacos was curbed – and I can safely say that the tacos weren’t up to my expectations, as well as my company for the afternoon. Perhaps it was because the place was busy so they didn’t put much care into the tacos. Unfortunately, my visit to Seven Lives was a bit of a disappointment.